When Karl Esther and his fiancée Ashleigh Riddell stopped to fill up at Gulf’s Boldon Lane Service Station in South Shields, little did they know that they were also driving into the holiday of a lifetime. 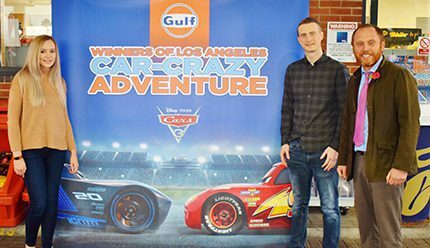 The happy couple will now embark on a Los Angeles Car-Crazy Adventure as the winners of Gulf’s Cars 3 forecourt promotion, which was launched nationwide over the summer in conjunction with Disney Pixar and its animated sequel film, Cars 3. The competition ran in tandem with the theatrical opening of Cars 3, which follows the ongoing adventures of the legendary Lightning McQueen. The prize includes flights, transfers, four nights at the 4-star Loews Santa Monica Beach Hotel, Cadillac car tour, LA go pass, speedway go-kart racing, a trip on the iconic Santa Monica ferris wheel, free entry to the Petersen Car Museum and spending money. Cars 3 banners featured on participating Gulf service stations across the UK throughout the promotion, with runners up prizes including 5 Disney Store VIP experiences with £200 to spend, plus hundreds of items of Cars 3 merchandise as spot prizes.